If only if i could have these two dishes from California Pizza Kitchen like DAILY! This weekend at Bangalore was made worth the visit when i tagged along with my friends to the Indie March live music event at CounterCulture in Whitefield, Bangalore! Great music from some of the upcoming bands in India – see the action below! Hope you enjoyed the pictures as much as i did the event! Last week, i visited Pondicherry and stopped for lunch at the Naturellement Garden Cafe in Auroville. I had read some great reviews on Tripadvisor and other food blogs and decided to give the place a whirl! The Cafe has a very relaxing ambiance, having lunch under the warm sun and cool tree shade was very soothing – The mushroom soup was rich and creamy, but the Gnocchi with tomato sauce was disappointingly very average. For an Italian cafe, i expected much more. Yet, desserts more than made up for the main dish – Tiramisu (exceptionally strong liquor taste!) and the Swedish Cinnamon Rolls (ah heaven!). The staff is polite and courteous (all women staff), the produce is sourced locally from organic farms, there are homemade jams and sauces too! Clearly the Garden Cafe is a big draw for the residents in Auroville and nearby Pondicherry. Maybe i should try a different main dish next time! Auroville can be reached by car via the East Coast Road and is about 120Km from Chennai. 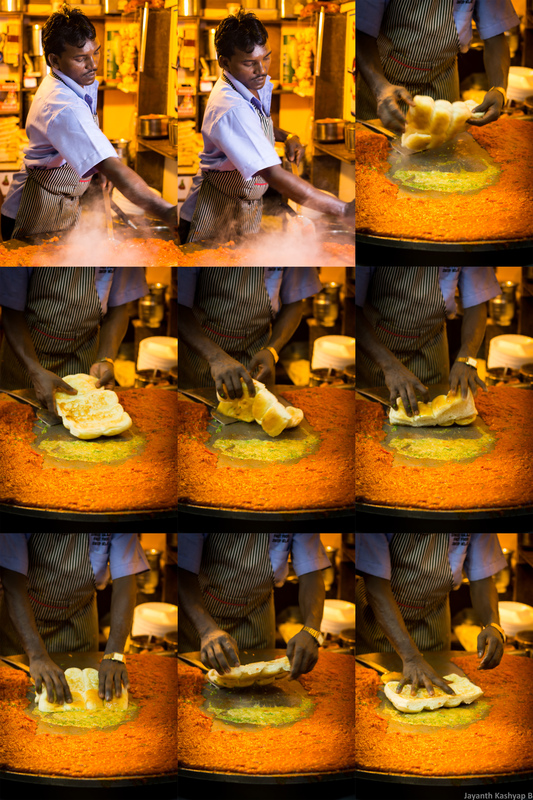 Pav Bhaji – Mumbai Style ! Namasthe! I just came back from a wonderful 5 day trip in Mumbai ! This was my first time and i was absolutely blown away by its culture, sophistication, people and of course its world-famous street food! The most amazing thing about WordPress is that the viewership is not restricted to the residing country of the blog owner, the reach to the rest of the world is instant, which makes explaining stuff like the above even more exciting for me! The pictures above were taken at the Chaat Bazaar, Juhu Beach. Standing among a booming crowd of hungry folks was an experience by itself! The dish being prepared is called Pav Bhaji. If you ever visit India, this street food is available on all menus across almost all restaurants. What makes it so amazing you ask? Well here is a little something i dug up about this fantastic dish – this fast food was invented in the 1850’s by a group of Gujarati traders using Portuguese loaf (yep there were Portuguese settlers back then) called Pao and Bhaji, a thick potato based curry, garnished with coriander, chopped onions with a dash of lemon! The Pav is heavily toasted in butter (!) and the final dish can be served with grated cheese and other suitable add-ons! Looks yummy right? ?